I still didn’t get it. We don’t usually construct things in English classes. Finally, she was able to explain that because the following Tuesday was a holiday, would we bridge the time between the weekend and Tuesday by canceling class on Monday. I assured her that we would not make the bridge. But as it turned out, we did. I arrived at school the following Monday to find the doors locked. Now, I have this discussion about making the bridge several times during the academic year. It gets dicey in December and April. Thanksgiving at the end of November notwithstanding, I always take a day off for my birthday--December 5. And December 8 is a holiday in Italy; if a bridge is involved with that holiday, it means we miss a lot of class prior to the usual three weeks at Christmas. In April, we often have Easter, where we take off the Friday before and the Monday after. 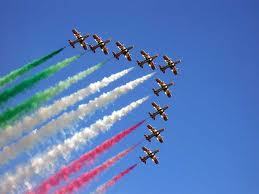 In addition, April 25 is a national holiday commemorating the liberation of Italy from the Nazis. This year, the 25th fell on Wednesday, and students wanted to make the bridge—two days! 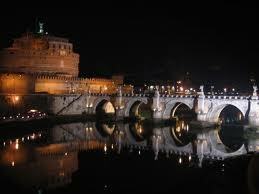 That would have been a Ponte Lungo (long bridge), which, ironically, is the name of a Rome metro stop. And so today we’re making the bridge because tomorrow, May 1, is Labor Day in Italy as it is in many parts of the world. I just wish the workers who are tearing out a masonry wall in the apartment next door were making the bridge today. Their noise has my head pounding. Hope the workers have gone and taken the headache with them!!! It seems that we Trinis "make the bridge" quite often, most times unofficially, but in the end we build many bridges!!! Hi, Geets. The workers did only a half-day yesterday, and they may have finished the job. At any rate, today's a holiday, so it's blissfully silent. I love this expression! I may adopt it myself. Nice post, Patricia. Thanks, Ramona. It is a nice expression, isn't it. That's funny. It's like in America where people work on Veterans' Day (early in November) in order to take of the day after Thanksgiving. In Italy, so far as I can tell, people don't have to make this up. I do because I'm contracted to teach a certain number of sessions per class, so if I skip one, I have to add one at the end.